The musical traditions of the Kurdish part of Iran form the foundation of Bahram's music. During this sixty minute recording, Bahram presents three of his own compositions, along with three folkloric tunes from his country, played on the Persian santoor and the zarb. The santoor is a traditional string instrument, which is said to create the sound of emptiness; the zarb is a drum often used to give the rhythm in Persian music. 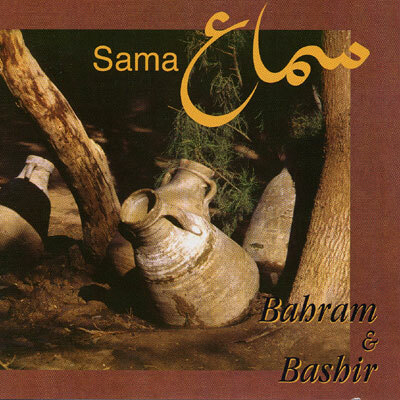 This collection begins with a soft santoor solo titled 'Prayer', and then moves into 'Sama', where the santoor melts with Bahram's voice singing the words of a poem written by Rumi, inviting the listener to enter the sama, to let the self go into the music. The circular drumming sound of Bashir's zarb then begins, the voice fades away, and together santoor and zarb fall into a trance, evoking the spirit of whirling dervishes. The music flows like an ever turning spiral through the room, as the same rhythm starts vibrating in your body; an incredible experience of becoming one with the music, one with the whole. The recording finishes with a joyous and celebrative tune called 'Kurdish Heritage', where once again Bahram's voice joins the overflowing dance of the instruments.